Idaho is home to 19 squirrel species -- including three species of marmots and five species of chipmunks. Several are considered threatened species and protected from hunting by state law. Others are so plentiful that they are considered nuisance rodents for whom no extermination limits exist. Technically, Idaho has eight species of ground squirrels. One of these -- the Idaho ground squirrel -- is divided into two groups by some taxonomy experts but not by others. This is because their closely related populations may have been a single range that is now geographically isolated. The first is the Southern Idaho ground squirrel, who lives in hill country surrounding the Payette River. 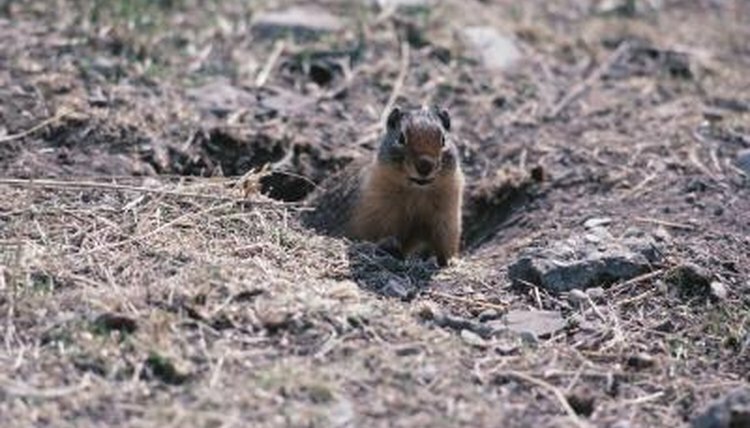 The second is the Northern Idaho ground squirrel, who makes home in west central Idaho in Adams and Valley counties between Hell's Canyon, the Seven Devil's Mountain and Cuddy Mountain; Long Valley as an eastern boundary. Both of these ground squirrels as well as the golden-mantled are protected species. Other ground squirrel species found in Idaho include Uinta, Belding's, Merriam's, Columbian, Wyoming and Piute. Idaho has only one species of tree squirrel: The red squirrel. He isn't overly picky about which trees he inhabits. In Idaho the red squirrel lives in abundant numbers in coniferous forests, mixed forests, deciduous forests and riparian woodlands. He does not hibernate but instead spends six weeks each fall storing up food -- the cones of spruce, fir and pine trees -- for the winter months. In the spring he eats nuts, fungi and fruit. He is protected from hunting in Idaho. The three marmots living in Idaho are the hoary, the yellow-bellied and the woodchuck. In Idaho, the hoary marmot lives in rocky areas in higher elevations. As his species is found in plentiful numbers from Alaska to Montana and Canadian regions in between, he is not a protected species in Idaho. The yellow-bellied species is also not protected due to stable population numbers in Idaho and elsewhere. He prefers to live in meadows, valley and foothill regions. The woodchuck marmot lives in northern Idaho, preferring woody or brushy areas near open farmland. The five chipmunk species living in Idaho are the yellow pine, the cliff, the least, the red-tailed and the Uinta. Yellow pine chipmunks require logs, rock crevices and stumps for nesting. Cliff chipmunks prefer juniper woodlands and lower elevations of pine forests. The least chipmunk is the smallest of all chipmunk species in Idaho and elsewhere; it prefers to live in sagebrush country. The red-tailed chipmunk lives in the northern panhandle section of Idaho, preferring forests with spruce, fir, hemlock, cedar and yellow pine trees. Uinta chipmunks live in coniferous forests at higher elevations, preferably near logs. Idaho Fish and Game: Why Is There No Squirrel Hunting Allowed in Idaho?